I knew it was too good to last! Last week’s walk in beautiful Warkworth was the start of a wonderful weekend. But our friendly landlord in the Hermitage Inn wasn’t wrong with his weather warning. Gentle drizzle gave way to big, fat splodges of rain! So, we ate a hearty breakfast, grabbed the golfing umbrella, and off we went. It was the day of our wedding anniversary and we had a date with a very fine castle, not to mention water gardens! A little rain wasn’t going to spoil it. ‘A day out to fire the imagination’ is how Alnwick Castle describes itself. I wouldn’t argue. That someone has a sense of humour and playfulness is evident the second you set foot on the estate. Sadly it all looked a little grim from beneath that umbrella. No worries! The castle opened its doors to visitors at 10.30, and for the first hour or more I was lost in a world of grandeur and elegance. Not for nothing was this place selected as the setting for the TV drama ‘Downton Abbey’. A sweep of softly carpeted stairway led up to the State Rooms. I gaped in wonder at the richly carved ceilings and the sumptuous furnishings. Exquisite Chinese cabinets vied for attention with the most imposing of fireplaces. Porcelain from Meissen glowed with colour. The long dining room was just that, and the library… it’s no wonder that the family should choose to spend time in such opulent comfort. Best of all, for me, the Canalettos gracing the walls. I have never felt closer to perfection. You’ll have to use your imagination, or visit the website because, of course, indoor photographs were forbidden. 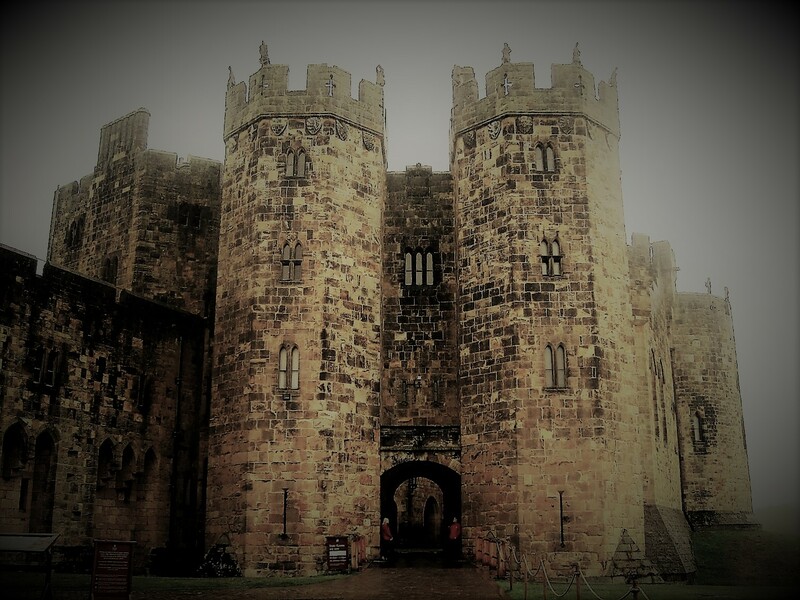 Alnwick Castle has been home to the Percy family for over 700 years. You may remember them from my Warkworth post. They owned that castle too. Like Warkworth, Alnwick Castle overlooks a river. The Aln, this time, but there the similarities end. Begun in 1096, following the Norman Conquest, it has been remodelled numerous times since Henry Percy bought it in 1309, as a simple motte and bailey. In the next 40 years he and his son converted it into a mighty border fortress, with strong gatehouse and towers. A full history can be read here. Today it is a castle that earns it’s keep magnificently. 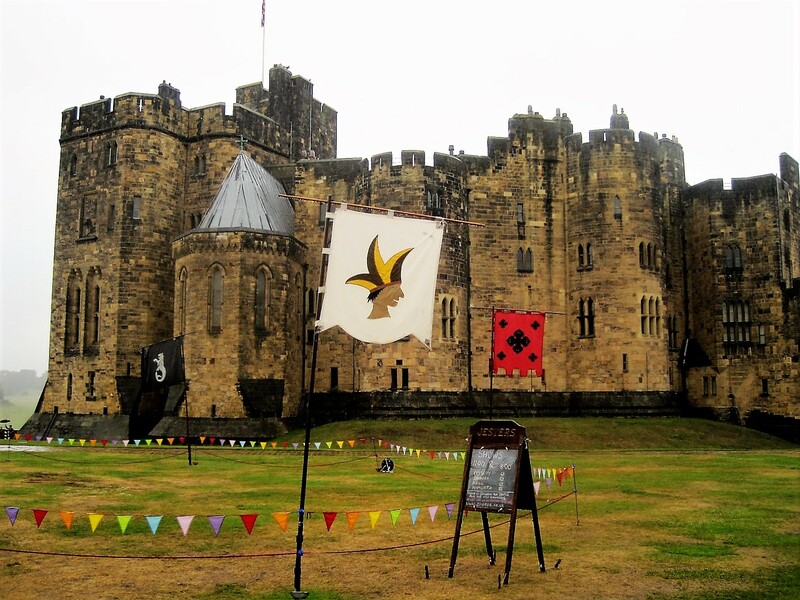 The grounds were all set up for Medieval games and the antics of a jester or two. Sadly they did not transpire. Alnwick Castle-0, Weather-1! But still, we refused to be disheartened. There were nooks and crannies to explore around the walls, and a lot more history to get to grips with. Children couldn’t fail to be happy here. Their very own Dragon Quest to take on, broomstick lessons and dressing up! Harry Potter seems to have left a little magic behind. An activity trail should keep them interested, while you look around. I found the museums within the castle walls very interesting, with the advantage that you could take photos. An illustrated ballad of the Hermit of Warkworth caught my eye, and a circular ‘cursing stone’, believed to be from the island of Inishmurray- one of 16 places in Ireland where prayers were said whilst on pilgrimage. The respective roles of the Percy family and what they brought to the castle over time are the main focus. The view from the walls of this Capability Brown designed landscape should be beautiful, but I didn’t see it at it’s best. I had planned to walk to the Lion Bridge but, as the rain puddled around me, I abandoned the idea. Time for a change of scene. What next? Water gardens, of course! I last visited The Alnwick Garden on a rainy day, soon after it opened in 2001. Jane Percy, the current Duchess of Northumberland, has a visionary approach to the restoration of the gardens, laid down in 1750 by the 1st Duke, with Capability Brown as his gardener. During the Second World War, supporting the slogan ‘Dig for Food’, the gardens were turned over to production. With no money to renew them, they subsequently fell into disrepair, and closed in 1950. With the ground breaking Grand Cascade at it’s heart, the Alnwick Garden covers approximately 12 acres of a carefully nurtured vision. We started our visit with a garden tour, during which a very pleasant young man explained the ethos of the garden. Let’s start, as he did, in the rose garden. The rain battered roses still clung to their fragile beauty, and isn’t that clematis an amethyst jewel? We stopped off to enjoy the stained glass irises on the Duchess’s gate, then on to the Ornamental Garden, up beyond the Cascade and the water gardens. Remember Playing with Patterns? Up at the top, we wait patiently for the fountains to begin their light-hearted dance. In prime position this year, the ‘Tommies’, commemorating the centenary of the end of the First World War with ‘There but not there’. They are in place till 11th November, Armistice Day. All the elements of fantasy are held in this garden, but there are strong ethics too. The Poison Garden is used to warn our young people of the dangers of drug abuse, and how easy it is to find the wrong path in life. Though beautiful, some of these plants are deadly. There is an inclusiveness to these gardens that I find very endearing. It has classical style in abundance, whilst not forgetting the community that surrounds it, and the issues of today. Though an expensive day out, I felt that the money was well spent for the joy it brings. And like all the very best days, it ended with cake! I hope you’ve enjoyed this special day with me. 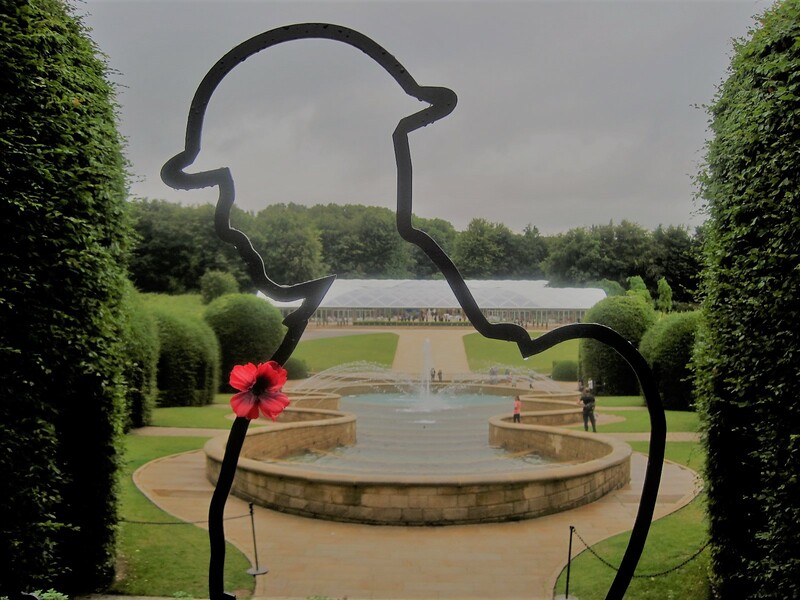 Full details, including how to get there, are in The Alnwick Garden. Definitely time to put that kettle on! Many thanks to you all. I have some great walks to share. Join me any time here on Jo’s Monday walk. You’ll always be welcome. Mundane, and yet not, from Jackie! No matter how many times you see this, it’s always beautiful. Thanks, Alice! I do like a smile on a Monday! I expect you do too! Whoopee! A walk I’ve actually done. Lucky lady got sunshine. It rained on me! A little grey today, but I’m hoping for better as I head out with my walker friends. Wishing you all a great week! There’s something for everyone there darling, and what an impressive art collection. A bit rude that the sun didn’t make the effort for you. I love the glass irises and the Tommies are a striking tribute aren’t they? Despite the dreary weather, the gardens still flaunt their beauty! Ooh, I would! Thanks very much, Candy 🙂 🙂 Sorry I’ve not been keeping up with you. Too many distractions. It’s a real beauty, this one! Especially inside 🙂 🙂 Downton Abbey all over again. What a treat to see this place Jo. I do admit to loving Downton Abbey. There are so many beauties, Amy. 🙂 🙂 Lovely to have you join me. The weather might have been miserable, but what a fabulous place to visit – your photos make it look wonderful. Thanks a lot, darlin 🙂 🙂 It really was! Whenever I visit the interiors of castles my foremost thought is about how they stay warm in the winter. Wonderful framing for both the first Tommie photo and the scene looking through the cross-shaped aperture. Darn that rain! And so glad it didn’t dampen your special day (belated Happy Anniversary!). What an incredible place with so much history and so much to see. The gardens have me hooked, the lonely Tommie figure striking and evocative. Hi Annika! 🙂 🙂 Good holidays? Back in the groove, no doubt! Thank you 🙂 Yes, a special place. There’s something so intriguing about a gloomy castle. I know you prefer sunny beaches, so good to know you made the best of it with your usual good humor. That cake at the end…was that a scone with cream? You always find the best desserts. I have to allow much more time for your posts than anyone else’s as they are so full and include so many images to admire! That’s not a complaint, by the way, I really enjoy them all. I have a rose called The Lady of Alnwick and now I know where it comes from, I think. Or maybe not. Is it a pink? I don’t know that one, Mari, but I do love roses. Harks back to my Mam 🙂 🙂 Thank you so much! You’re always a very kind and appreciative audience. It makes the time spent writing so worthwhile. It’s sort of between pink and pale lemon and is a Davis Austin Rose. I bought it purely because it is recommended for shady spots and I needed a rose for just that sort of site. Roses are my favourite flowers, a love I get from my grandfather’s garden when the whole place seemed full of roses. Probably just a child’s imagination but I do remember Sunday visits to the country when we returned with armfuls of roses, lupins and other flowers, so there must have been a lot. I, on my part, can only occasionally get a couple of roses to display tastefully in a bud vase! How I wish for a mass of blooms on a table, but supermarket roses do not have the same lush appeal as the home grown rose. We’ve visited this one, your photos of it are lovely. Thank you! 🙂 🙂 It’s a true beauty, even on a rainy day. Despite the weather, it looks a good day out. Sometimes, I think castles look better in overcast conditions. More atmospheric. And is that last one a scone stuffed with cream! Drooling! How gorgeous! The rain may have been a slight hindrance to walking pleasure, but it didn’t spoil the view! And that cake is another view I’d have enjoyed. 🙂 Very special, Jo! What a beautiful walk even in the rain. I love the first opening photo where the castle is shrouded in fog. It looks so mysterious. Happy anniversary too! Love your walks as always Jo. Northumberland is special for coast and castles, Nicole. Did you see the Warkworth walk? Blue skies aplenty! 🙂 🙂 Thanks, darlin! Wow, awesome photos as always Jo. I love reading about your castle walks. Thanks so much, Arlene 🙂 🙂 It’s a whole different world for you, isn’t it?